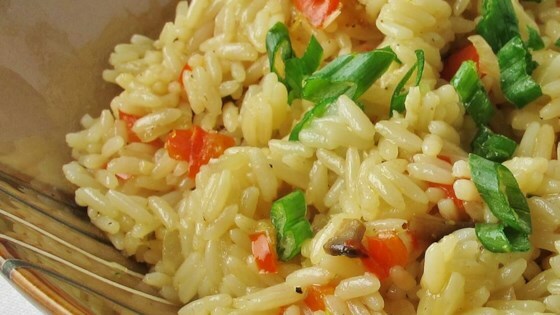 "This recipe makes a delicious side dish. Goes good with meats and veggies. It's a tasty rice with a little bit of spice! I LOVE garlic, so if you don't like it as much as I do, then just add 2 cloves instead of 6." Melt butter in a large pot over medium heat; cook and stir onion, red pepper, mushrooms, and garlic until tender, about 10 minutes. Stir in rice. Add chicken stock; cover and boil until liquid is absorbed, about 10 minutes. Season with red pepper flakes, salt, and black pepper.